The Mirabell Mozart bar is a perfect composition of fine praline cream and delicate marzipan cream covered in fine milk chocolate. It not only captivates through its perfectly harmonised fillings, but also through its unique shape. The Mozartkugel in the form of a bar is particularly suited for the personal enjoyment of milk chocolate fans. 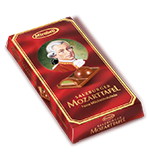 The Mozart balls can be enjoyed in chocolate bar form.